Despite advances in car engine efficiency, mobile workers use more fuel and increase your company’s carbon footprint. You will make a business more sustainable quickly if you reduce the mileage they travel. Yet reducing miles while maintaining security is not easy, if you rely on mechanical keys to lock remote sites. CLIQ® Connect eliminates the need for workers to return to headquarters to collect or return a mechanical key. With CLIQ® Connect, everyone carries their own programmable CLIQ® key and keeps its access rights up-to-date on the move with just a smartphone — meaning fewer miles driven and less money wasted on unnecessary fuel. It’s an easy solution to becoming more sustainable. Part of the trusted CLIQ® access control ecosystem, CLIQ® Connect makes an immediate operational impact. 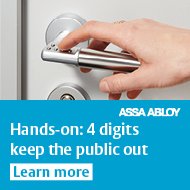 The wire-free locking system is based on multiple mechatronic cylinder formats and programmable electronic keys. With CLIQ® Connect, a key-holder no longer updates their access rights physically in person by returning to base, nor even moves to the nearest programming device. All they need is the CLIQ® Connect app and a Bluetooth connection. The app pairs your programmable CLIQ® Connect key, via an encrypted connection, with the CLIQ® Web Manager. To change a key-holder’s access rights or key validity, a system administrator accesses the CLIQ® Web Manager — from anywhere — and updates it. The system is managed easily by secure cloud-based software interfaced with the app. A key-holder makes a Bluetooth connection between their CLIQ® Connect key and the app to instantly update access permissions or key validity securely. There is no travel involved and zero fuel consumption. A recent Future of Fuels report concludes: “Fuels create many sustainability impacts and addressing them should be a high priority for companies.”* CLIQ® Connect keeps your business moving in the right direction.